Around January 20, 2009, when Barack Obama took over the office of president of the United States, there was quite a lot of media attention about the fact that he had to give up his BlackBerry, because it was considered to be a security risk. This caused almost world wide media attention, but the follow-up was less accurately covered and a number of different stories were told. Here we will show that Obama actually kept his beloved BlackBerry, but only after it had been secured by special encryption software and some additional security measures. Obama's predecessor, George W. Bush, also used a BlackBerry during the 2000 presidential campaign, but had to give it up, as well as the use of any e-mail software, upon taking office. Three days earlier, he sent out a final e-mail to 42 friends and family members to inform them that he would no longer correspond electronically. 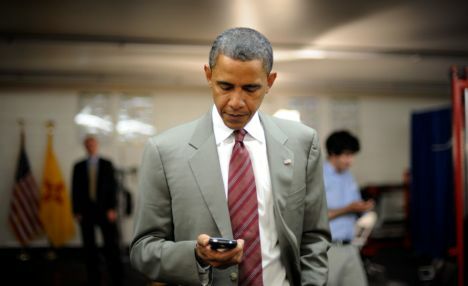 Eight years later, Barack Obama was also forced to give up his BlackBerry, not only because of concerns that its communications and e-mail could be intercepted, but also because of the Presidential Records Act of 1978. This makes all written White House communications public property and subject to examination under the Freedom of Information Act (FOIA). 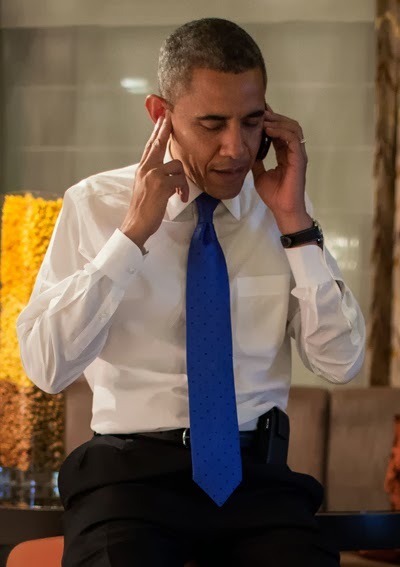 However, this time Obama definitely wanted keep using this popular business phone to stay in touch with people outside the White House bubble. Therefore, the Secret Service, The White House Communications Agency (WHCA) and the National Security Agency (NSA) went looking for a solution. 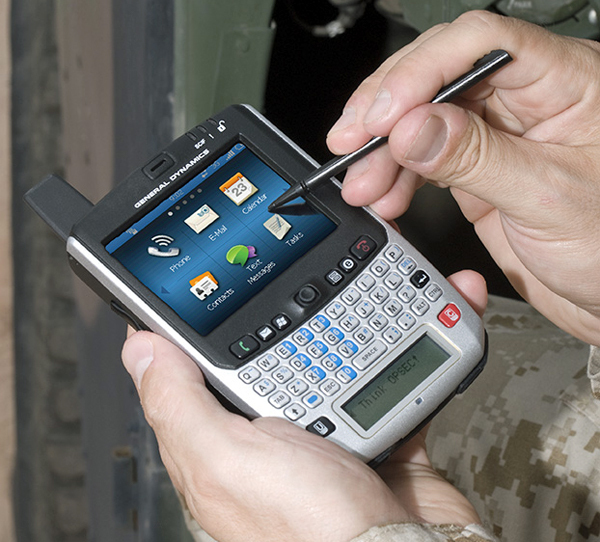 Some media suggested Obama had to change his BlackBerry for the Sectéra Edge, a highly secured PDA, which is produced by General Dynamics for the US military. But the Sectéra Edge is quite big, heavy (340 grams) and bulky and therefore hardly convenient for someone used to a BlackBerry. This solution would also require everyone that Obama would like to communicate with to have the same phone, which is priced between 2650,- and 3350,- USD. Secure communications are only possible if both ends use the same (or compatible) encryption devices. According to other sources, the Sectéra Edge was only used in addition to Obama's BlackBerry, until a permanent solution was worked out. Reports weren't clear about how exactly these two devices were combined. Probably the Sectéra Edge acted like an encryptor, which was plugged into the BlackBerry, so Obama could keep using this device to make a call or send out an e-mail, which then went through the Sectéra Edge, encrypting it, before going over the telecommunications network. That latter, temporary solution must have been even more cumbersome, so a compromise was made, in which president Obama could keep using a BlackBerry, but equipped with a software package to encrypt phone calls and text and email messages. For this purpose, the security agencies choose the SecurVoice application, which was developed by The Genesis Key, in cooperation with engineers from BlackBerry manufacturer Research In Motion (RIM). SecurVoice should not be confused with Secure-Voice.com, nor with SecuVOICE, which is used for securing the smart phone of the German chancellor Merkel. 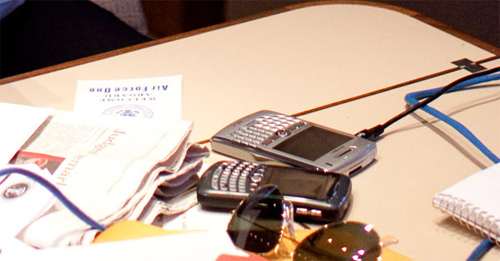 After the NSA did all the necessary tests and checking to make sure the software met federal standards like FIPS 140-2, the highly secured BlackBerry was delivered to the president somewhere in May or June 2009. 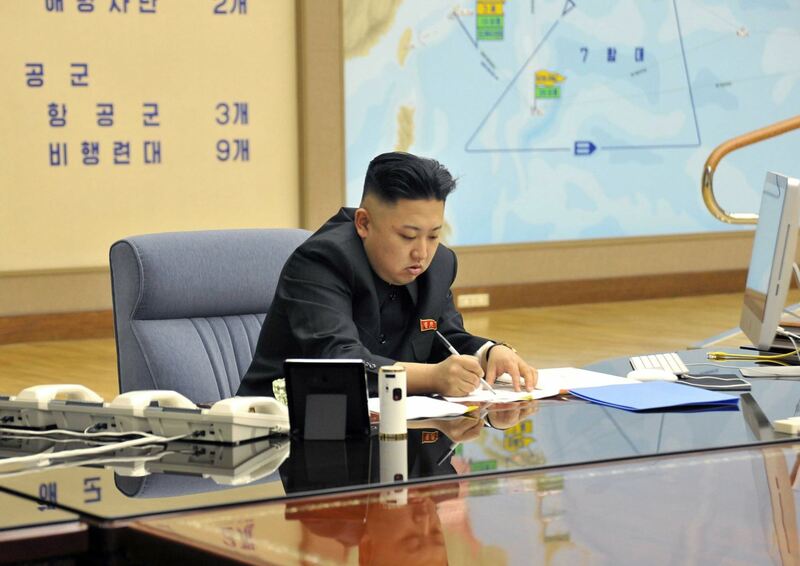 He also gave up his old e-mail address and switched to a new one, which is kept secret. 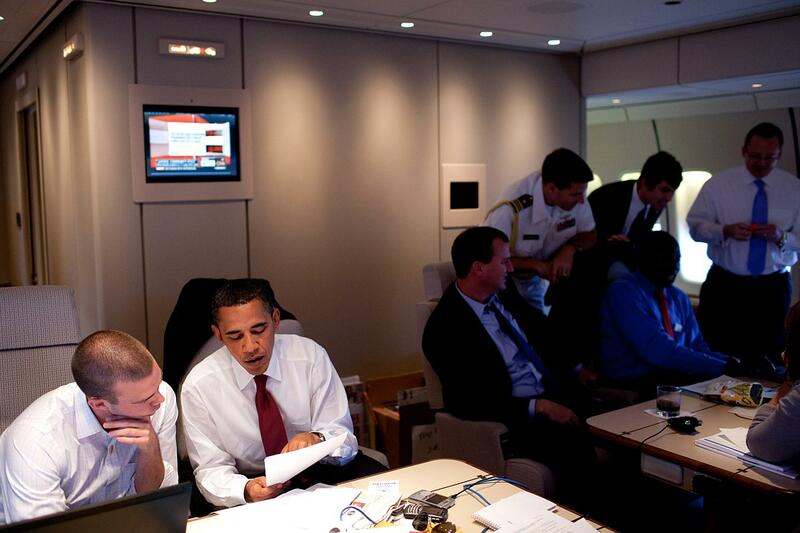 aboard Air Force One enroute to Paris. In front of him are a black and a silver Blackberry. The secure BlackBerry was not only issued to the president, but also to a small group of people with whom he likes to stay in close contact with. This because, as said, it's only possible to have secure communications if both ends are using the same encryption method. This limited Obama's goal of keeping in touch with the outside world: encryption (still) means exclusion. The number of people able to message and call the president is probably only between ten and twenty. Included are vice-president Biden, Obama's chief of staff and some of his top advisers, his press secretary, first lady Michelle Obama, a few other family members, and a small group of personal friends from Chicago. On October 30, 2013, Obama's press secretary Jay Carney said that the president will continue to use his (secured) BlackBerry, despite concerns about eavesdropping which came up after it was revealed that NSA intercepted the communications of 35 world leaders. On March 16, 2016, AP reported that in February 2009, then-secretary of state Hillary Clinton also wanted a secured BlackBerry like the one used by president Obama, but that NSA denied that request. A month later, Clinton began using a private server, located in the basement of her home, to exchange e-mail messages with her top aides through her regular, non-secure BlackBerry. Later it came out that this rather risky solution was also used for sensitive messages. The SecurVoice software for the presidential BlackBerry was developed for a small company called The Genesis Key, Inc., based in Washington DC. This company was founded in October 2008 by W. Steven Garrett, who took the name from an item used in the 1986 computer game The Legend of Zelda. The software was developed in the previous four years, apparantly for one of the projects of Steve I. Cooper, a former special assistant to the president, senior director for information integration, and CIO (Chief Information Officer) for the Office of Homeland Security. He is now a member of the advisory board of SecurDigital, Inc., a firm founded in October 2009 by Bruce Magown and Steven Garrett to distribute the SecurVoice software applications. Steven Garrett is a man with a quite surprising background. His Linked-In profiles show that he has been involved in a very wide range of businesess, like manufacturing plants for Fannies Fat Free Cheesecakes and Fat Free Burger (providing microwave-ready cheeseburgers to military commissaries) and marketing & sales for Lion Sportswear and Faded Glory Jeans. He also developed a highly secure appartment building, named Garrett Place. At his twitter account he describes himself as "Proven Rainmaker, Change Agent, Strategist, and Driving Force for Unprecedented, Exponential Growth in Revenues, Earnings, and Market Valuation". The Genesis Key released the SecurVoice software in December 2008, claiming this to be the world's first completely secure voice and data encryption solution. Allthough there were already a number of other hardware and software encryption solutions, the SecurVoice application should be able to protect global voice connections between and within all types of cell, satellite, PBX, SDR and VOIP phones and phone systems. SecurVoice is 100% Java based, which should make it device- and carrier-independent, but according to the website, the software is currently only operational on the Blackberry operating system version 4.5 and up. Software porting for other operating systems, like Symbian, Brew, Windows Mobile, Google, and iPhone is said to be underway. With SecurVoice, each phone can be loaded with up to three levels of security, each one accessible through a separate icon and recognizable by a different ringtone. When dialing a number and this number has a cryptographic key associated with it, then the call is automatically placed as a secured call. If a phone number has no cryptographic key associated with it, then the cell phone operates normally and the call is placed unencrypted. - Phone-to-Phone (P2P), where secure calls are made directly from one cell phone to another. The price for government users is 1795,- USD per application. 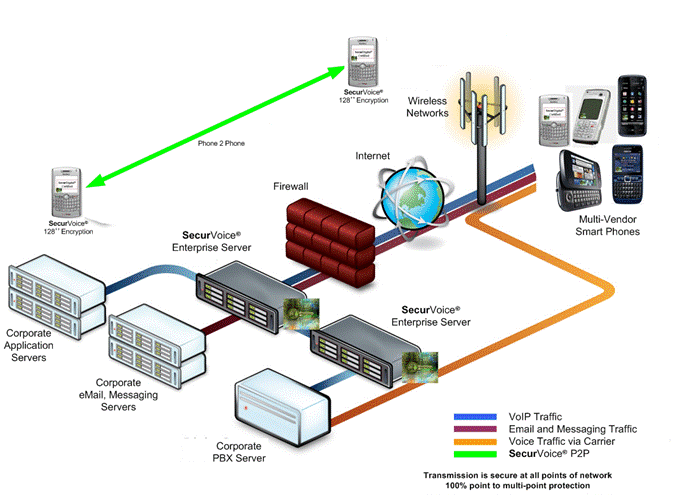 - Phone-to-Server (P2S), where secure calls are routed from the phone to an enterprise server and back. The price of a server license is between 2500,- and 25.000,- USD. It's likely, that for Obama the server solution was chosen. This allows a centralized key management, monitoring of all secure calls and record keeping of the messages. One source says the president may have to wait up to 50 minutes for an e-mail reply, as the system actively sniffs out incoming messages for viruses or Trojan horses. The SecurVoice software features a dual-layered, or hybrid encryption scheme, which means it combines symmetrical and asymmetrical encryption algorithms. It performs the voice encryption in real time by using a fast symmetric cipher, using a strong key. This key is then encrypted with a public-key or asymmetrical cryptosystem, like RSA or ECC, and transmitted together with the encrypted message. This is also how the vast majority of present-day communications encryption works. The SecurVoice symmetric encryption uses a 256-bit session (conversation) key, which replaces the encryption every second with non-reoccurring numbers. This session key is a combination (salted hash) of the sender Base Secure Key (stored in the recipient key store) and a random session key. According to the manufacturer, SecurVoice uses classified Type 1 encryption algorithms, which are restricted to government and military users. For corporate users, public crypto algorithms like AES are used. In case of a SecurVoice enterprise server, the software converts voice into encrypted data, which is then sent over the carrier network to the SecurVoice Enterprise Server where it is decrypted. It is then re-encrypted and sent back over the carrier network to the receiving phone, where it is decrypted and converted back to voice. It's also possible to select different encryption algorithms, so that, for example, encryption from a cell phone to the enterprise server may be the AES algorithm with a 128-bit, while from the server to the receiving phone this may be done by using Elliptic Curve Cryptography (ECC). from the University of Indonesia to the airport in Jakarta, Indonesia. 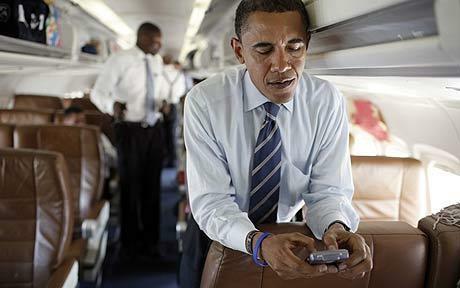 As Obama wanted to keep using a BlackBerry device, the security solution is software only. This still leaves risks like compromised hardware and hacking by means of social engineering. Therefore, some security specialists say that it's not impossible to hack Obama's BlackBerry and that foreign states and other hackers will likely try to do so. To minimize these risks, the secured BlackBerrys prevent forwarding e-mail messages from the president and sending him attachments. His secret e-mail address is likely to be changed regularly as well and Obama's friends and staff members were lectured about these security issues. Another risk of the president using a BlackBerry, like a cell phone in general, is that enemies can try to track the president's location in real-time, even when GPS is disabled. Every cell phone regularly transmits it's IMEI-number to the cell tower, and this can be intercepted by devices like a Triggerfish. How this tracking can be done, and countered, is described in this, respectively this article. 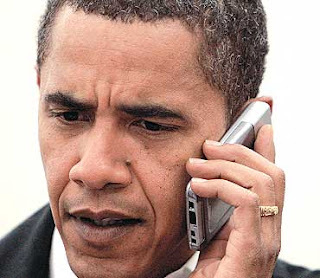 One source says the presidential BlackBerry can only connect to a secure base station, which can be used to hide the IMEI-number of the device and thus prevent tracking it. This would mean the White House Communications Agency has to carry such a secure base station wherever the president goes. There must be also a secure base station inside the presidential limousine, as we can see in the picture above. 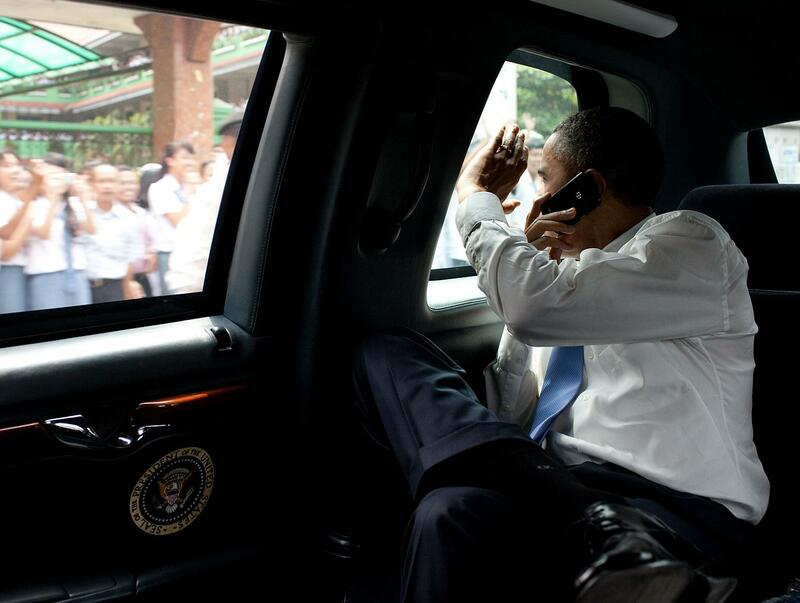 First because using a foreign cell phone network would be a big security risk, but also because the limousine is most likely constructed like a Faraday cage, and therefore a BlackBerry could only be used if there's a base station in the car itself (and probably also in Air Force One). The secure base station is probably connected to a secure satellite link with Washington. As we have seen, president Obama has kept his BlackBerry, but only after it had been secured. This took quite some effort: newly developed software had to be tested within a couple of months, all his contacts have to use the same software, limiting their number to a rather small group, and a secure base station has to follow the president. Nonetheless, this ad hoc solution for the president marks the beginning of an era in which top level mobile communications will no longer be secured with dedicated hardware, but by using software applications for regular commercial smartphones. By the end of 2014, a Russian state-sponsored hacker group, known as Cozy Bear, was able to infiltrate White House e-mail servers containing the sent and received emails of president Barack Obama, but they failed to penetrate the servers that controlled the traffic from his personal BlackBerry. The Dutch Joint Sigint Cyber Unit (JSCU) monitored these hacking operations and alerted the Americans. - September 2010: The X-Change Corporation Acquires Genesis Key, Inc.
Last week, North Korea said that it entered a "state of war" with neighboring South Korea. According to a report from the state-run Korean Central News Agency (KCNA) this includes a threat to "dissolve" the United States mainland too. 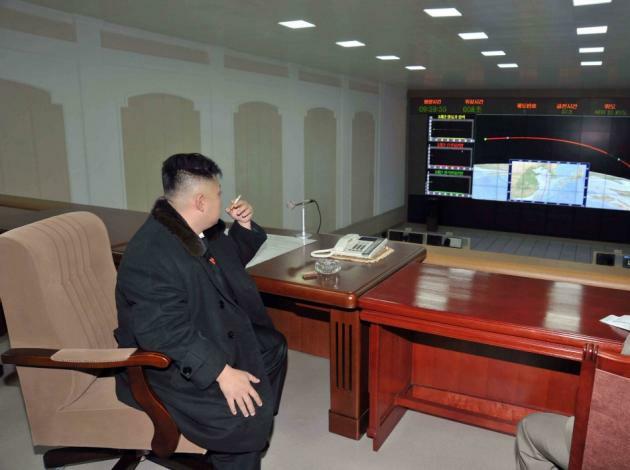 at the Supreme Command in Pyongyang, March 29, 2013. Quite surprisingly we see that at the right side of the table, there's an aluminum unibody iMac computer (with a corded keybord and mouse). This computer is made by the American manufacturer Apple and is an iconic capitalist lifestyle item. If this isn't a fake remake, it's a bit strange that we see this computer here, because there's a full US embargo for exporting products to North Korea. Probably the iMac came in from China, the only ally of the communist republic. The whole arrangement looks very much like propaganda, and we can doubt whether the iMac is very functional: with a close look we can see that the yellow ethernet cable lies disconnected next to it. Earlier in March, North Korea already disconnected various hotlines with South Korea. One hotline, which is maintained by the international Red Cross and runs through the truce village of Panmunjom, was cut off on March 11. This also happened with another hotline, which connects to the US-led United Nations Command at the border. On March 27, North Korea also cut off a military hotline with South Korea, that allows cross-border travel to the jointly run Kaesong industrial complex in the North. This hotline, which actually consists of four telephone lines, is used to communicate about the daily cross-border traffic of about 900 workers and cargo traveling back and forth to the Kaesong complex. Now there is still one active hotline left (consisting of three phone lines), linking the civil aviation authorities of North and South Korea.